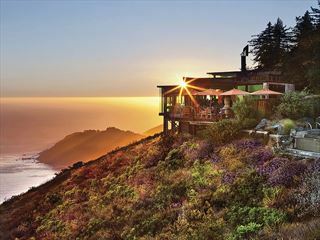 Stunning and relaxing, the elegant Carmel resort is abundant with the natural beauty of Northern California, offering intuitive service and memorable experiences in a striking venue. Stroll through the spectacular grounds of the nearly 500-acre countryside estate. Challenge yourself on the picturesque golf course, designed by Pete Dye. Test your skill on the court with the award-winning tennis programme by Peter Burwash International or retreat to the spacious, all-suite accommodations to enjoy a soothing fireplace and breathtaking vistas of Carmel Valley. Savor incomparable comfort and leisure in an exquisite setting. This charming ranch is located in Carmel, a beautiful beach city along the Monterey Peninsula. It's the perfect location for those hoping for plenty of outdoor recreation, including cycling, sailing and hiking - all finished with a trip to a local restaurant or a sumptuous wine tasting tour. The elegant studio-style Saint Lucia Suite features a king-sized bed, cosy fireplace, cathedral ceiling, flat screen high definition television, well-appointed bathroom with seperate shower and soaking tub, and private deck with forest or valley views where you can enjoy an afternoon cocktail. The Ranch Suite has over 800 square feet of space and a fireplace in the bedroom, these suites are both spacious and luxurious. Each suite features a treetop or forest view, a bedroom with king size bed and a seperate living room with queen size sofa bed. There are 2 flat screen high-definition televisions, a fireplace, cathedral ceilings, private deck, i-pod docking station, and oversized bathroom with seperate shower and soaking tub. The Garland Suite offers treetop or forest views, a large bedroom with king size bed, a seperate living room with a queen size sofa bed, a private wraparound deck, two flat-screen high-definition televisions, cathedral ceilings, i-pod docking station, an oversized bathroom with seperate shower and soaking tub and fireplaces in both the bedroom and living room. The Carmel Suite offers two seperate bedrooms, a comfortable living room with queen size sofa bed, and a private deck with valley or poolside views. The master bedroom features a king size bed, while the second bedroom offers one king or two double size beds. Both bedrooms include spacious bathrooms with seperate showers and soaking tubs. This luxury suite includes two fireplaces, 3 flat screen high definition televisions, and cathedral ceilings. Two sun-drenched outdoor salt water pools and two hot tubs, including one with an infinity edge overlooking Carmel Valley. Spa Aiyana - Spa Aiyana's inspiration unfolds with each passing season, providing guests with uniquely cultivated products that showcase the "craft" of customised spa rituals. The abundance of florals, herbs and botanicals that dot the landscape of Carmel Valley ranch is truly a gift! The natural harvest is continuously cultivated and renewed, and brought to every guest experience offered at Spa Ayiana. Golf - Challenge your skill on a rolling, 18-hole, Pete Dye-designed course, which meanders along the Carmel River and through a forested back nine. Tennis - Play like a pro in the 9 court tennis complex, including 7 resurfaced hard courts and 2 clay courts, plus a "sport court". Fitness - 2 fitness centres with state-of-the-art equipment. Ranch Hand Kids Camps are designed by certified schoolteachers, and inspires and initiates unforgettable experiences. The Lodge - The executive chef's culinary exploits - many involving fruits and vegetables from the Ranch's Organic Garden - are on full display for breakfast, lunch and dinner in the Lodge Restaurant. Indoor, outdoor and lounge seating are all available. River Ranch Cafe - The newest addition to The Ranch's collections resides in its most historic building which is 132 years old. The high-energy, family-orientated River Ranch features a mix of your favourite grill items; sandwiches, salads, sweets, coffee, smoothies, beer and wine. Order at the counter or browse the bountiful Grab 'n Go selection. Indoor and outdoor seating are both available. Golf Clubhouse - conveniently located near the 9th and 18th holes, the Golf Clubhouse offers light sandwiches, salads and beer on tap. Ideal for a quick bite before or after your round. 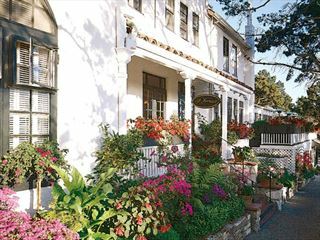 The Carmel Mission Inn provides that great central location to explore Carmel and all that the Monterey Peninsula has to offer.